While each product on this list uses the power of steam to clean, you’ll want to think about the way you intend to use your steam cleaner. That will help you determine the best model for your needs. Should I Buy a Steam Mop or Handheld Steam Cleaner? The main difference between a steam mop and a handheld steam cleaner is the type of surface you can clean with it. If you buy a steam mop, it will work wonderfully for cleaning floors made of tile, laminate, and hardwood to kill dust mites and bacteria. Many steam mops even work on carpeted floors and rugs. However, such a tool can only be used on floors. If you’re looking for a more versatile machine, choose a handheld steam cleaner. These tools are often more lightweight and come with different attachments that you can use to steam-clean furniture upholstery, mattresses, curtains, and anywhere else dust mites gather. 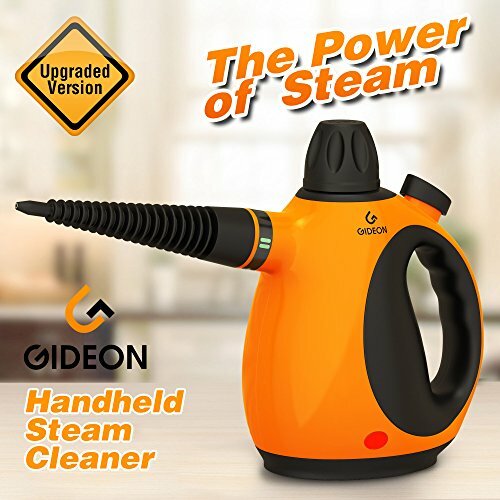 If you want to use the power of steam to keep many surfaces in your home or business clean and sanitized, then a handheld model may be a better investment. Some devices offer the benefits of both a steam mop and a handheld steam cleaner. These mops may be larger and bulkier but typically detach so that you can use the handheld function. With one machine, you can steam-clean the carpets and then use the handheld device to rid curtains and pillows of dust mites. What Is a Dry Steamer or Vapor Steamer? “Dry steam” may seem like an oxymoron, but it’s an important term to know when you’re looking to buy a steam cleaner to kill dust mites. These pests thrive in humid environments, which is why they nest in bedding and other fibers that absorb moisture. By using dry steam to clean your mattress or curtains, you avoid adding extra moisture, which could invite more dust mites to settle there. In addition, dry steam delivers more heat to effectively kill the mites and germs in the area. A vapor steamer is another word for a dry steamer. A vapor steamer relies on very hot water only to sanitize, eliminating the need for chemicals. When you’re looking for a new steam cleaner to help sanitize your home or business, here are the top five product recommendations. This 19-pound machine is specifically designed for use on carpets. Its innovative design spins carpet fibers rather than rolling over them to ensure a deep clean. The brushes and water tank are removable for easy cleaning and refilling. This carpet cleaner relies upon detergent to scrub carpet fibers, but it comes with different settings for cleaning and rinsing the carpet of soap, which it mixes automatically to give you the right ratio. Its heated suction helps the carpet dry quickly once cleaned. While this machine is a best-seller when it comes to carpet cleaning, it’s not really designed for killing dust mites. It will help freshen your carpets by picking up dirt and allergens, but you should not use it on mattresses or bedding, which do not dry as quickly as carpet. This steam cleaner can be used on practically any surface to remove grime and sanitize germs. Although it takes several minutes to heat, an indicator light displays when the steam is ready, and the large capacity of the water tank means it can produce steam for about 45 minutes before needing a refill. This machine can handle everything from hardwood floors to small faucets. 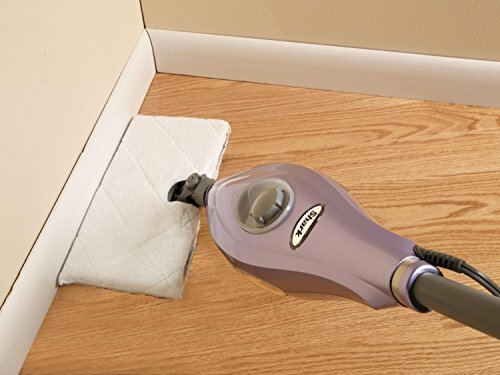 Its many attachments make it ideal for using the power of steam to clean all types of upholstery, so you can rid your mattresses, curtains, couches, and rugs of dust mites. 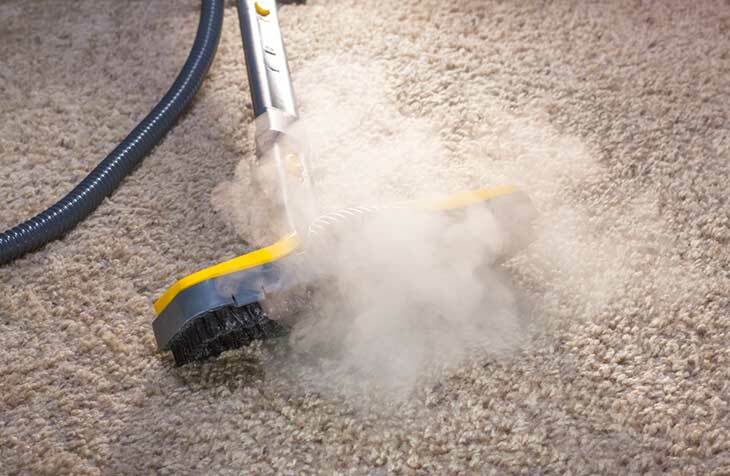 It may not be the best steam cleaner for carpets because the moisture can sink through to the carpet pad, but it is portable enough to easily clean all over the house. This heavy-duty machine is suitable for cleaning all types of surfaces from barbecue grills to car upholstery, so once you’ve rid your home of dust mites, you can freshen and sanitize practically any surface. Its versatility makes it worth the higher price, and all of its attachments have a storage space right inside the unit. This machine relies on the power of steam to sanitize hard flooring like tile, stone, and hardwood. Its soft microfiber mop head scrubs and shines floors, removing even stuck-on residue, while the steam rids floors of bacteria and allergens. Because no chemicals are required to use this lightweight steam mop, you can trust that no further allergens will be used in the cleaning process. However, if you wish to add freshness while mopping, the machine comes with Febreze brand fragrance discs. 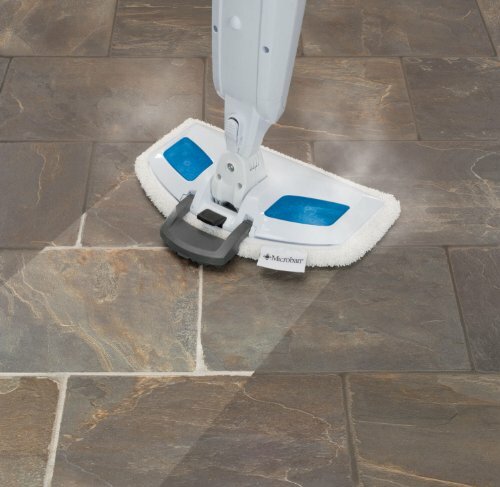 Three different cleaning settings let you adjust the level of scrubbing to tackle tough floors. This mop is effective in generating hot steam to clean hard flooring, and it’s easy to operate. However, if you want a steam cleaner to eliminate dust mites, this steam mop may not be the best choice. Most dust mites accumulate in fibrous material, so steam-cleaning your tile or wood floor would do little to reduce the pests throughout your house. 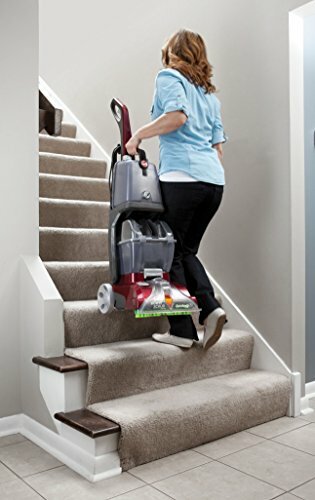 However, if you have dirt and other allergens on your hard flooring, this mop works well and seems to live up to the manufacturer’s claims of steam-cleaning twice as fast as similar models. This machine is one of the most lightweight steam cleaners available. However, with that portability come fewer features than some other models. Much like the Bissell steam mop, this Shark machine relies on a removable water tank to produce steam that sanitizes hard floors. The key difference is that this model relies on the back-and-forth motion of mopping to release the steam. The manufacturer claims it can produce steam in 30 seconds to help kill germs and lift stains from hard floors like tile, laminate and marble. This steam cleaning mop is great to use for quick jobs because it heats steam so quickly, but its small water storage tank means that more refilling will be required to clean a larger area. Like the Bissell, this mop should only be used on hard floors, so its ability to rid your home or business of dust mites is minimal. This handheld steam cleaner is designed for small jobs rather than an entire floor, but it supplies a powerful jet of steam for up to 20 minutes. It has a completely handheld design, so you can carry it throughout your home or business to sanitize and disinfect. The manufacturers recommend using this steam cleaner for all types of hard surfaces to remove grime and germs. This machine is designed to clean grime from a variety of hard surfaces rather than kill dust mites and remove allergens. It will do a great job freshening and disinfecting surfaces like kitchen counters, car tires, tile grout, and other surfaces prone to dirty crevices. Although it has a small upholstery attachment, its strong jet would likely be too powerful to use on mattresses and fibrous surfaces. 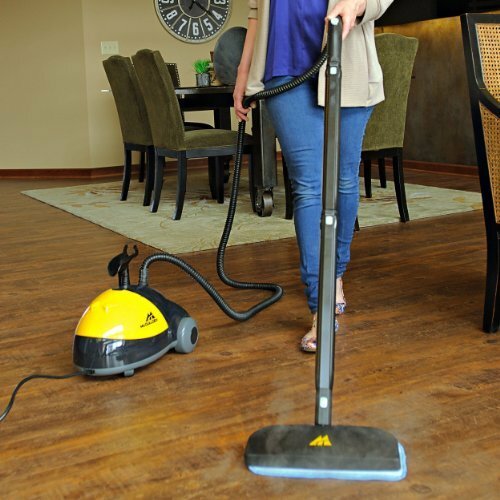 Using it on flooring is possible but would take much longer than other steam cleaners. If you’re looking to eliminate dust mites all over your home, go with the McCulloch MC1275 Heavy-Duty Steam Cleaner. While some steam cleaners are only suitable for hard floors or small areas, this incredibly versatile steam cleaning machine can tackle everything from tile to sofas. Its many attachments store right inside the unit, and it conveniently wheels around with a lengthy power cord and hose. It may be a pricier machine, but being able to use it for everything from mopping the floor to removing grime from shower faucets makes it worth the price. In addition to cleaning practically every household surface, it effectively sanitizes to kill dust mites and remove other allergens, all without harmful chemicals.